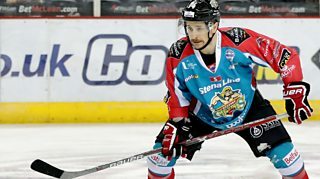 Belfast Giants return to second place in the Elite League with a 4-3 victory over Nottingham Panthers in England. David Clarke put the hosts ahead but the Giants hit back with goals from Matt Towe and James Desmarais. Matt Carter made it 3-2 before Steve Saviano added Belfast's fourth while Chris Lawrence's goal set up a tense finale.